The Long Christmas Ride Home is not your typical Christmas show. The very first statement director Susan Hardie makes about The Long Christmas Ride Home is both a lure and a caveat. "It's not your typical Christmas show." Truer words have rarely been spoken. Paula Vogel's 2003 play, now in a short-run fundraiser production for Stage Left Theater, is conventional neither in its tale nor the telling. Unlike many holiday shows, even those that flirt with unhappiness, such as A Christmas Carol and It's a Wonderful Life, it takes a patient eye to find any glimmer of redemption in The Long Christmas Ride Home. Its story around the pivotal moment in a family's collapse is also recounted through role-shifting actors, sound and puppets, all of which borrows heavily from an ancient Japanese style of performance known as bunraku. The mention of puppets runs the risk of evoking visions of the Muppets and Sesame Street, and not without good reason. Mainstream musicals and movies like Avenue Q and The Happytime Murders have deliberately played on that huggable, cartoonish style of puppetry for tonal effect. Although The Long Christmas Ride Home employs its own puppets to the same end, bunraku calls for a much different approach in design and execution. "The puppets in this play represent children in a very real way," says Hardie. 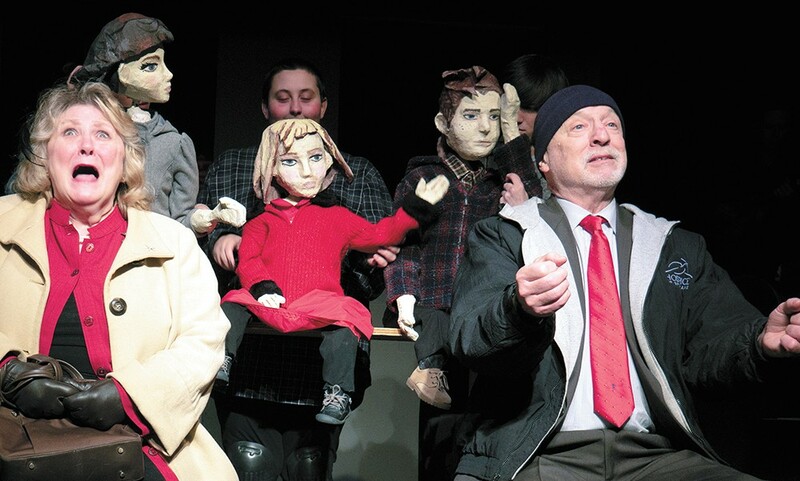 "And the play is about what happens to these children based on their experiences with their nuclear family, so they're not very happy-go-lucky puppets. They're very real puppets." That naturally raises a question or two. If it's important that the puppets in The Long Christmas Ride Home have a realistic element to them, why not use live child actors? What does the play gain from using strings instead? "It's just a very effective storytelling tool," she says. "Because puppets are not real people, they're a little more of a blank slate where we can layer our own feelings onto them, and I think that's part of what Paula Vogel wanted to do with this play, to give you a little bit of distance from the story," which is told primarily through the eyes of Stephen. Along with Rebecca and Claire, he's one of the play's three troubled siblings. All three struggle with relationships into adulthood, perpetuating the sad legacy of their parents, played here by Pamela Kingsley and J.P. O'Shaughnessy. The child puppets, designed by Cassie Coleman-Heppler, aren't the only ones featured in this show. There's a mask designed by Kevin Brownlee, puppets by Patti Cardinal and Polly Powell that appear in a Christmas pageant scene, and shadow puppets by Patrick Treadway. Each fills a unique narrative role in the play and is styled visually and operationally to suit. A shadow puppet, for example, "provides another emotional and physical presence onstage," Hardie explains. In this production of The Long Christmas Ride Home, they're used during the monologue portions that come after the adults — performed by Cooper Wutzke, Jennie Oliver and Andrea Tate — have emerged, butterfly-like, from their childhood selves. During these scenes, the script has the actors speaking to an unvoiced presence. "There are two very different styles of shadow puppets. One of them is a Muppet-like puppet, so it's just kind of a head and shoulders. The two ladies, the two lesbian lovers, are more mechanical and more cut-out, true shadow puppets. You can tell the emotional state of the puppet by the way the shadow puppet is maneuvered, and hopefully in context, you know exactly what that puppet is trying to say." Supplying another vital component of bunraku is Todd Milne, a local musician known for his Far Eastern instrumentation, including a Japanese bamboo flute called the shakuhachi. "He really provides the soundtrack for the show: music, underscoring, the sounds of car chains going through the snow, the sound of human breath. He's using the ukulele, wood blocks, a Japanese drum — all kinds of instruments to make these sounds," Hardie says. "Although it's not constant underscoring, it's consistent all the way through. So he's with us onstage, and I consider him another character in the play because, just as the actors have their voice, his way of telling the story is through music." To some theatergoers, the relative exoticism and rawness of The Long Christmas Ride Home might seem antithetical to the cheery, celebratory types of productions they've come to want and expect around the holidays. But Hardie says there are "elements of hope" that puts the play at home in the season, even as it sets itself apart. The original print version of this article was headlined "Strings Attached"